BELIZE CITY, Wed. June 17, 2015–Gerald Garbutt, 69, who worked at Radio Belize as a technician when it was the only radio station in the country as well as an arm of the government, and who was station manager for a fledgling KREM Radio in the early ‘90s, as well as a sports aficionado and president of the Belize Cycling Association, died at the Karl Heusner Memorial Hospital (KHMH) last night, Tuesday, from heart-related complications. Garbutt had been ailing for several years and reportedly suffered a stroke at his Racecourse Street home, where he resided with his wife, who rushed him to the KHMH. After the government dismantled its radio broadcast monopoly and KREM Radio became the first private radio station in 1989, Garbutt worked as manager of the station up to the early 1990s. In the complex world of radio broadcasting, Garbutt had the talent for getting the show on the road on time with his attention to details and his no-nonsense approach to his job. Garbutt would later start his own radio station, FM 2000, in the 1990s, and that station became the forerunner to the Opposition People’s United Party (PUP) radio station, Positive Vibes. Garbutt’s involvement in sports, and particularly cycling, is legendary, and he was one of the persons who assisted in the founding of the annual New Year’s Day KREM Cycling Classic. 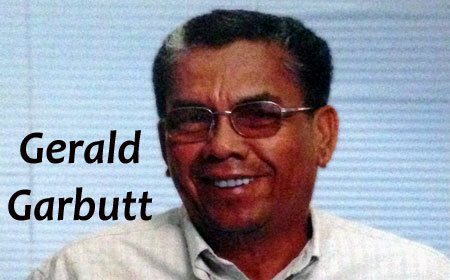 Garbutt also served as the president of the Belize Cycling Association. Apart from cycling, Garbutt also lent his considerable energies to basketball and football, sponsoring a number of teams. He was also involved in dominoes tournaments, several of which were held on his farm, located in Biscayne, Belize District. Gerald Garbutt was predeceased by his parents, Nicholas Castenada and Violet Garbutt. Garbutt leaves behind to mourn his passing his wife Anita Garbutt and daughter, Andrea Garbutt, who is a doctor residing in Canada, three brothers and three sisters, and a host of nieces, nephews and friends.